Travaux Préparatoires = "[French 'preparatory work'] Materials used in preparing the ultimate form of an agreement or statute, and especially of international treaty; the draft or legislative history of a treaty." Black's Law Dictionary 1638 (9th ed. 2009). 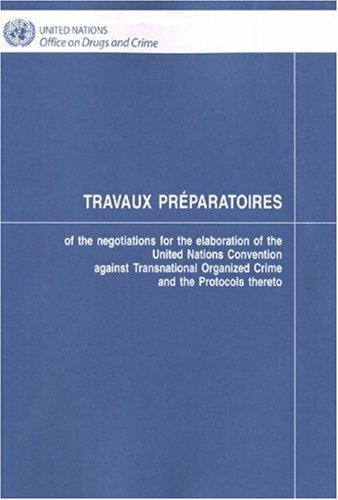 Travaux Préparatoires, often referred to as travaux, are an important source when interpreting treaties because they can help elucidate the drafters' intent. Consulting travaux is an essential research step when treaty interpretation is at issue. Jonathan Pratter, À la Recherche des Travaux Préparatoires: An Approach to Researching the Drafting History of International Agreements, GlobaLex (Nov./Dec. 2012). Martin Ris, Treaty Interpretation and ICJ Recourse to Travaux Préparatoires: Towards a Proposed Amendment of Articles 31 and 32 of the Vienna Convention on the Law of Treaties, 14 B.C. Int'l & Comp. L. Rev. 111 (1991). Available at the International Criminal Court website. From the United Nations website. Available at ICJ website in PDF format. Series of Resolutions relevant to the Statute of the Tribunal. Letter dated 24 May 1994 from the Secretary-General to the President of the Security Council. Report of the Secretary-General pursuant to para. 2 of the Security Council resolution 808 (1993). Available at the SCSL website. A list of travaux available at Pace Law Library related to criminal law and beyond. Click here for more titles. 8 volumes: v. 1. Preparatory Commission of the Council of Europe, Committee of Ministers, Consultative Assembly, 11 May-8 September 1949 -- v. 2. Consultative Assembly, second session of the Committee of Ministers, Standing Committee of the Assembly: August-November 1949 -- v. 3. Committee of Experts (February-March 1950) -- v. 4. Third and fourth sessions of the Committee of Ministers, Conference of Senior Officials (30 March-June 1950) -- v. 5. Legal Committee, Ad Hoc Joint Committee, Committee of Ministers (June-August 1950) -- v. 6. Consultative Assembly -- v. 7. Standing Committee of the Consultative Assembly, Consultative Assembly Committee of Experts, Committee of Ministers, Legal Committee (3 November 1950-15 May 1951) -- v. 8. Consultative Assembly, Committee of Experts, Committee of Ministers, Legal Committee, Advisers to the Ministers (1 October 1951-20 March 1952). Introduction to the negotiation history -- Amendments to the Rome Statute on the Crime of Aggression -- Historical documents -- Travaux preparatoires of the amendments to the Rome Statute on the Crime of Aggression -- Index of travaux preparatoires.